The holidays are coming and along with the holidays come holiday stains. Every year we bring out our nice table linens and then come the spills. What are some of your worst spills and how do you beat the stains? 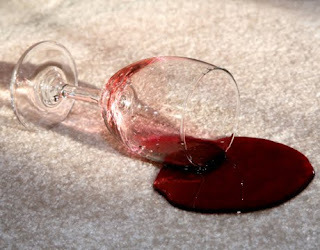 One of my favorites is how to stop red wine from staining linen or carpets. As soon as there is a red wine spill grab for the salt. Pour salt on the red wine until the top layer of the salt no longer turns red for the wine. Leave the salt on the wine until it has been able to pull all of the stain out. The salt will absorb all of the wine so it will not be able to stain anything. It's one thing to not cry over spilled milk, but it's an entirely different thing to hold back tears when a full glass of red wine leaves its mark on your carpet. I am looking for the solution to it.